Economy class return air fares from the UK (flight inclusive option). If you are travelling land only, check with our office for joining time at the airport. Walk the final stage of the Camino de Santiago to reach the great pilgrims’ city of Santiago de Compostela. The Camino del Norte has many treasures to discover; the friendly local people, the wonderful local delicacies at fabulous, atmospheric hotels such as Parador de Vilalba and Pazo Santa Maria, walking through rural Northern Spain through pretty forest trails, and of course, arriving at the imposing Santiago de Compostela, to complete the pilgrimage. We welcome you on this fine modern day pilgrimage on the Camino del Norte (the Northern Way), the final stretch of the famous Camino de Santiago – also known as the Way of St James. This delightful trek shows the best that the region of Galicia in northern Spain has to offer. The Camino del Norte is one of several pilgrimage routes to Santiago and has the benefit of being more peaceful than the well-trodden Camino de Frances, but still has good facilities and is a varied and interesting trek. In fact the two routes join together at Arzua so you can enjoy both the tranquillity of the Northern Way and the camaraderie of the French way. The entire Camino del Norte is 817 km long and runs all the way from Irun on the French border, to Santiago. We take the week long, 160 km final stage into Santiago – with the famous Santiago de Compostela as your goal. This final stretch of the Camino turns away from the coast at Ribadeo and you can begin to experience rural northern Spain. You pass through farmland with pleasant rolling hills and lush greenery, and see many horreos where farmers store their corn. You trek through stylish towns with pleasant cafes and restaurants, quaint villages, medieval monasteries and impressive cathedrals. There is ample time for exploration and also to relax with a café con leche or cerveza in one of Galicia’s many cafes and bars. Your trip will be led by an enthusiastic, English-speaking Spanish guide, and all your luggage will be transported by vehicle each day so you only need to walk with a very light day sack. As your journey progresses you will get a sense of what life was like for the early pilgrims and, on reaching the ancient cathedral in the heart of Santiago, you will also have a deep sense of achievement. The cathedral houses the relics of St James and was one of three major centres of Catholic pilgrimage in medieval times. Many thousands of people from all over the world still make the same journey today although not always for spiritual reasons. Superb walking, wonderful scenery and a good physical challenge are among the motivations for many modern day pilgrims. Unlike the original pilgrims, you will enjoy a great deal of comfort on your trek as we have selected the best hotels or pensions for your overnight stops. Two particular gems are the fabulous Parador de Vilalba which is situated in a former tower of a medieval family castle, and the exquisite country house hotel near Arzua. Set in a stunning rural location it has beautifully decorated rooms and a cosy dining room with a roaring, open fire. Sampling octopus, a Galician delicacy, in the atmospheric restaurant in the Parador is a well-deserved treat after the day’s exertions on the trail. And, even in the more simple pensions you can be assured of a warm welcome and comfortable bed. Having successfully completed the last 100 km of the Camino de Santiago you will be entitled to receive a ‘Compostela Certificate’ - a unique souvenir and testament to your unforgettable journey. Fly to Santiago. Group transfer to Ribadeo. Walk to Vilalba via overnight stops at Lournza and Abadin. Walk from Vilalba to A Roxica. Visit the monastery of Sobrado des Monxes. Drive to Aruza. Walk to O Pedrouzo and on to Santiago. Arrive at Santiago de Compostela. Group transfer to Santiago airport. Fly to London. Our Camino de Santiago holiday is led by professional Spanish guides who speak excellent English and who are very knowledgeable about the local history, flora and fauna. 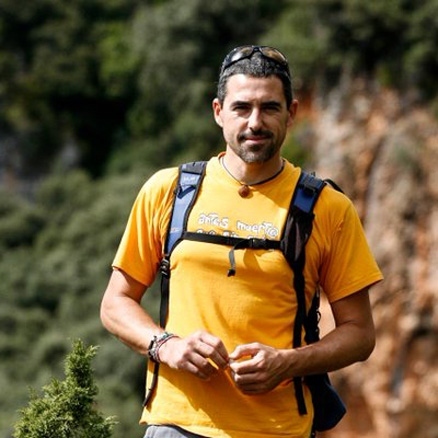 Guides may include Íñigo Ayllón, a Professional Mountain Guide who holds degrees in Law and Mountain Sports. He dedicates his time to his passion, the mountains, working as a guide and as a legal adviser for activities in the natural environment. He is from Aragon and he speaks Spanish and English. Day 1 - Fly London to Santiago. Group transfer to hotel. On arrival at Santiago airport there will be a single transfer to Ribadeo to coincide with the timings of our group flight. Ribadeo is a pretty harbourside town set on the river that divides Galicia from Asturias. It has an attractive old town and a celebrated beach nearby where rocks form natural arches thought to resemble cathedrals. Day 2 - Walk from Ribadeo to Lourenza - 27.5 km, 6-7 hours. You begin your holiday hiking away from the coast. After walking through the town of Ribadeo, you head off on a rising forest trail. Most of the way to Lourenza is off road on very quiet farm tracks. You pass through the ever present eucalyputus trees and later, native trees. You may be lucky and spot hoopoes here. The countryside is very pleasant as you pass through farmland with rolling hills in the distance. Interestingly, the Camino waymarks are read oppositely to those in Asturias (the previous district). The direction of the route is indicated by the lines of the scallop that diverge. You pass through Vallamartin Pequeno and Villamartin Grande, Gondan and San Xusto, the latter two having albergue de peregrinos (pilgrims' hostels). Lourenza is home to a 10th century Benedictine Monasterio de San Salvador. It has an impressive Baroque façade and contains a museum of religious art. It is also famous for its 'fabas' - local beans. You overnight in Pension Casa Gloria. As there is no restaurant in the pension, you'll dine out at a local restaurant. Day 3 - Walk from Lourenza to Abadin - 24.5 km, 5-6 hours. You head into the hills today with lovely views of the surrounding countryside. It is about an 8.5 km walk into Mondonedo, which was once one of the seven capitals of the Galicia kingdom. Mondonedo is a lovely town with pleasant bars and cafes around the cathedral square. The Romanesque cathedral is a national monument, and it's worth sitting in one of the cafés opposite to admire its impressive facade. You walk uphill out of Mondonedo, and weave your way upwards past the villages of Barbeitas, Maariz, Paadin, San Vicenzo and Lousada before descending into Gontan. You continue to walk on a mixture of forest trails, farm tracks and quiet secondary roads, walking up to a pass. After the pass it's about 3 km to Abadin where you will spend the night. Abadin, the capital of the Concello, has a food store, pharmacy and some bars and restaurants. Day 4 - Walk from Abadin to Vilalba - 19 km, 4-5 hours. After walking through the town of Abadin, you continue on quiet roads for approximately 2.5 km and cross the River Adadin. You pass through the villages of Ponterroxal and Martinan. About 14 km from Abadin you pass through Goiriz which has a hostal, bar and restaurant. You later pass As Casonvas and A Casilla. Your walk today is on a mixture of forest trails, quiet rural roads and farm tracks, passing many farms - a perfect insight into life in rural Northern Spain. It's a pretty quiet, peaceful walk, just passing the occasional villager, farmer and pilgrim. For the next two nights you'll stay in the very impressive, Parador de Vilalba Hotel - a wonderful, 4 star hotel which has been converted from a 15th century castle, complete with tower, owned by the Andrade family. The restaurant where you'll dine in the evening is atmospherically situated in the tower. The hotel restaurant serves excellent food - try some of the local delicacies such as octopus, and a selection of local cheese. Their puddings are delicious too and with all that walking, you'll have earned the indulgence! Day 5 - Walk from Vilalba to Baamonde - 21 km, 4½-5½ hours. A lovely walk today through the heart of the Terra Cha region of Galicia that is famed for its dairy produce - particularly its cheeses. Terra Cha means 'flatlands' and indeed your walk today has few undulations. It is also a good area for birdwatching and on the 2017 recce of this route, we saw hoopoe, black woodpeckers, white storks and chiffchaffs - your guide will help you spot and identify any birds or wildlife you encounter. After about 4 km of your walk you pass through the sleepy villages of Gabin and then As Turbelas. Shortly after you come to San Xoan de Alba (just over 6 km from Vilalba) where you'll find a medieval church. After the church you follow the Camino signs on a mixture of paved roads, dirt tracks and footpaths until you reach Saa which has a medieval bridge over the Labrada. Minor roads and dirt tracks take you through the villages of Penas, Contariz, Casanovas and Ferreira before you arrive at Baamonde. Baamonde contains the 14th century Church of Santiago, and also the museum (former home) of sculptor Victor Corral. From here you will be driven back to your hotel at Vilalba. Day 6 - Walk from Baamonde to A Roxica - 4½-5½ hours. Drive to Sobrado dos Monxes to see the monastery and on to Arzua. You return to Baamonde to start the next stage of the Camino. After crossing the River Parga, you pass the 14th century Chapel of San Alberte. This is a very pleasant stretch for 5 km or so with gorse bushes, scrubland and a wide track with stone walls, before emerging onto paved roads through farmland countryside. The walk to Miraz from Baamonde is about 14 km long. Miraz has a bar and a couple of pilgrims' hostels. En route you pass through the villages of San Alberte, Toar, Bandoncel, Diga, Raposeira, Aldar and Seixon which has a bar and 12th century church. From Miraz you continue for approximately 6 km, with a pleasant uphill, off-road section. As the route from A Roxica to Sobrado dos Monxes is all on tarmac, we have arranged a vehicle transfer to take you to the monastery (25 km drive) and then onto Arzua where you'll stop for the night. The Santa Maria de Sobrado Cistercian Monastery, with its splendid Baroque frontage, has its origins in the 10th century as a twin family monastery and convent belonging to the family of Count Hermenegildo. It became a Cistercian Monastery in 1142. The way of life of the Cistercian monk is simple and austere, lived in an atmosphere of silence and separation from the world. Arzua is a market town and houses a church containing a 19th century medallion depicting Santiago's intervention in Clavijo. It's also famous for its delicious cheese! Tonight you'll stay at the Pazo Santa Maria, a renovated nobleman's house, oozing with character and charm. Day 7 - Walk from Arzua to O Pedrouzo - 19 km, 4-5 hours. Today, the Camino del Norte joins the other great pilgrimage route to Santiago - the Camino de Frances. This is a far busier trail so you will now be walking with more pilgrims; heightening the sense of expectation and giving a feeling of companionship as you trek together towards your final destination. The walk to O Pedrouzo takes you through small hamlets and forests, passing A Calzada, A Calle and Salceda. If you're feeling thirsty, A Brea has some bars, about 13 km from Arzua. You proceed on paved roads, following the Camino signs through Santa Irene, which has a couple of pilgrims' hostels, and Rua, before reaching O Pedrouzo. O Pedrouzo is a pleasant town with quite a few bars and restaurants. You'll dine out in one of the restaurants this evening. Day 8 - Walk from O Pedrouzo to Santiago de Compostela - 20 km, 4½-5½ hours. Well this it is - the finale to your pilgrimage on the Camino del Norte. After just over a kilometre of walking outside of the town of O Pedrouzo, you can enjoy the last stretch of off-road hiking, on a footpath through forest with stone bridges and streams. It's mainly flat today, so not too taxing. You will doubtless feel a great sense of anticipation as you head towards your final goal alongside other pilgrims following their own quest. After about 8 km of walking you reach Labacolla, where pilgrims used to wash themselves in the river before arriving in Santiago. A further 8 km brings you to famed Monte de Gozo where you may get your first distant glimpse of the towers of the cathedral of Santiago de Compostela. It takes a while from the busy streets leading into Santiago to reach the Cathedral. It is well worth the wait though as you approach it on quaint, narrow, cobbled lanes with lovely boutique shops, and plenty of restaurants and cafes. Following in the footsteps of hundreds of thousands of pilgrims through the ages, you make your way to Plaza del Obradoiro which is dominated by the Gothic façade of the Romanesque cathedral that houses the remains of St James the Great. Here, at the Cathedral's steps, you reach the culmination of your journey. Having successfully completed your pilgrimage, you can now claim your Compostela Certificate from the Pilgrim’s Office which your guide will help you with. Day 9 - Transfer to Santiago airport. Fly back to London. After breakfast there will be a single transfer to Santiago airport which is timed to fit the group flight. Please check with the office for details. A beautiful route through rural northern Spain, the Northern Way has everything: wonderful scenery, fantastic food, great places to stay, friendly locals and an interesting history. This route offers an insight into the rural existence here, that insight being enhanced by our knowledgeable guide. It is worth taking an extra day or two in Santiago either at the outset, as we did, or at the end, taking time to explore the old town area.